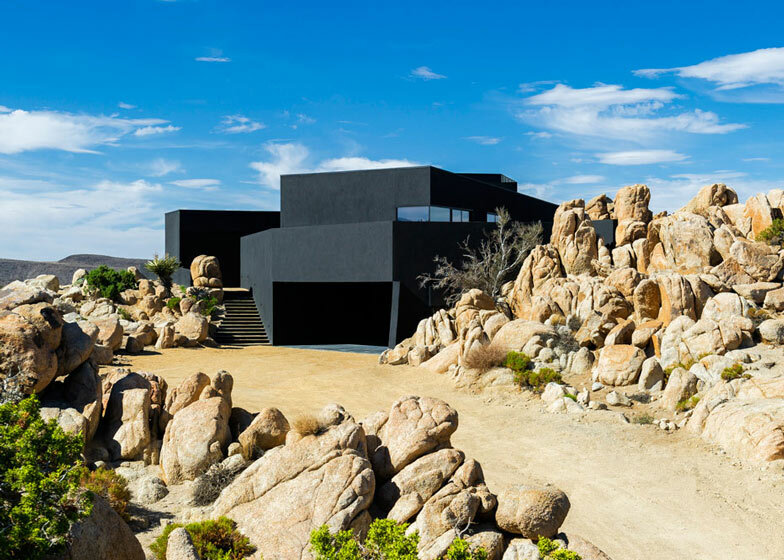 This all-black house in the Yucca Valley desert was designed by Los Angeles office Oller & Pejic to look "like a shadow" (+ slideshow). 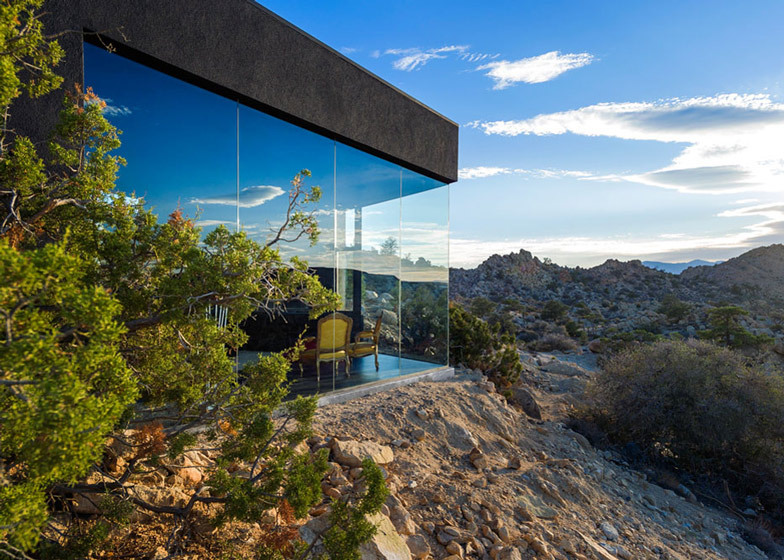 Located within the borders of the Joshua Tree National Park, where sunlight is often painfully harsh, Desert House was designed by husband and wife architects Monica Oller and Tom Pejic as a volume that would be easy to rest the eyes on. 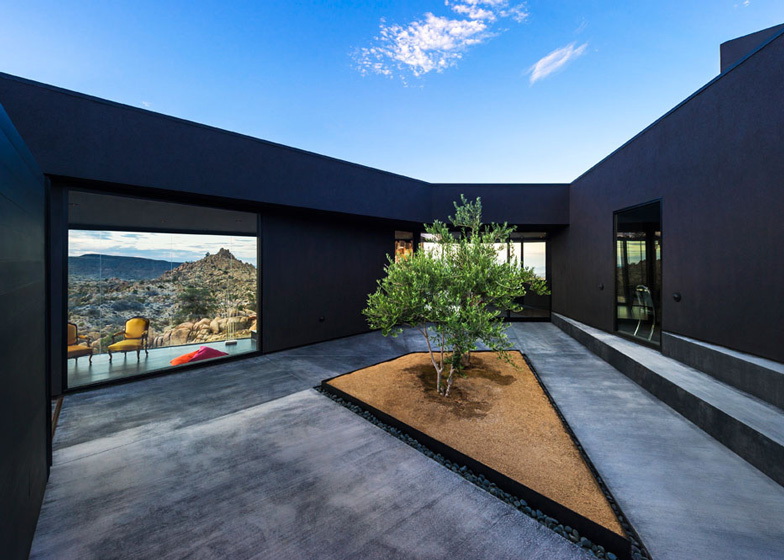 They explained: "Our client had given us a brief but compelling instruction at the start of the process - to build a house like a shadow." 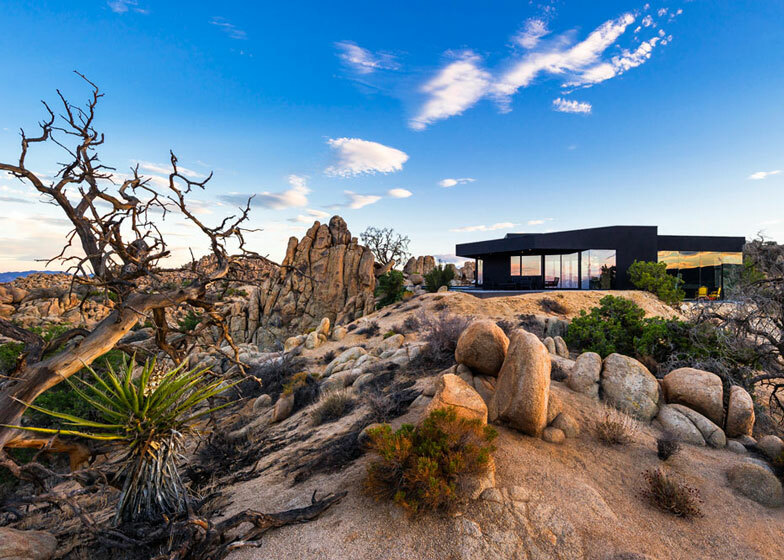 Despite its remote rural location, the house was constructed on a site that had been flattened in the 1960s. This meant the building couldn't be staggered down the slope and was instead designed with a mostly level floorplate that ends at the edge of a precipice. 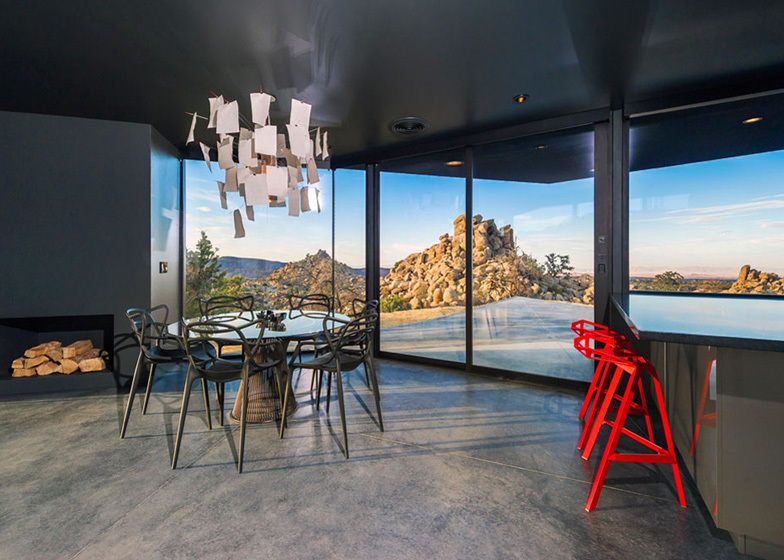 "The house would replace the missing mountain that was scraped away, but not as a mountain, but a shadow or negative of the rock," said the architects, explaining how they imagined the design early on in the process. The two wings of the house sprawl out across the site, framing various outdoor spaces. A courtyard is sandwiched between the bedrooms and living spaces, while a swimming pool sits in the south-east corner and a sheltered triangular patio points northwards. "We wanted the experience of navigating the house to remind one of traversing the site outside," added Oller and Pejic. The open-plan living room and kitchen forms the the largest space of the house. 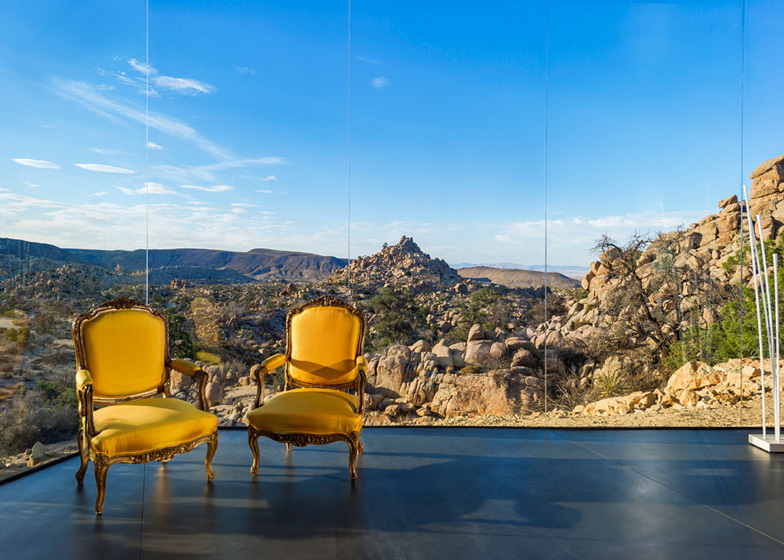 Floor-to-ceiling windows open the space out to the courtyard and offer panoramic views of the vast desert landscape. Both this space and the adjoining bedroom wing feature black walls inside as well as out, intended to create a "cave-like feeling". 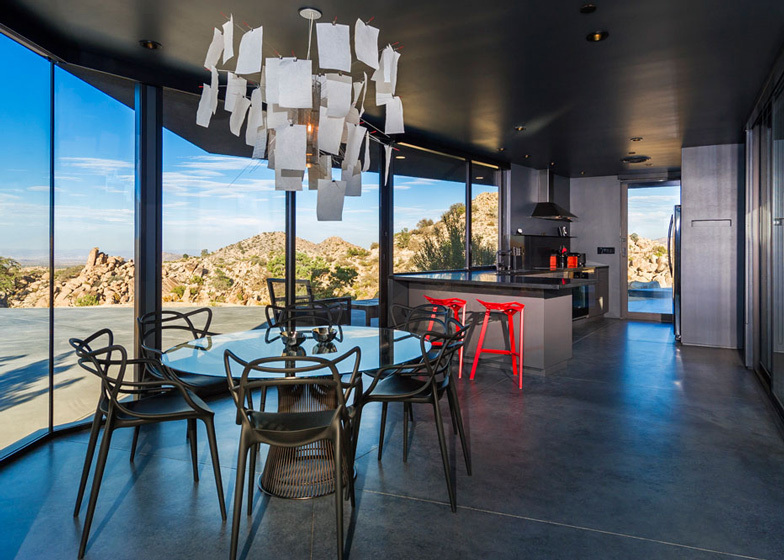 "During the day, the interior of the house recedes and the views are more pronounced. 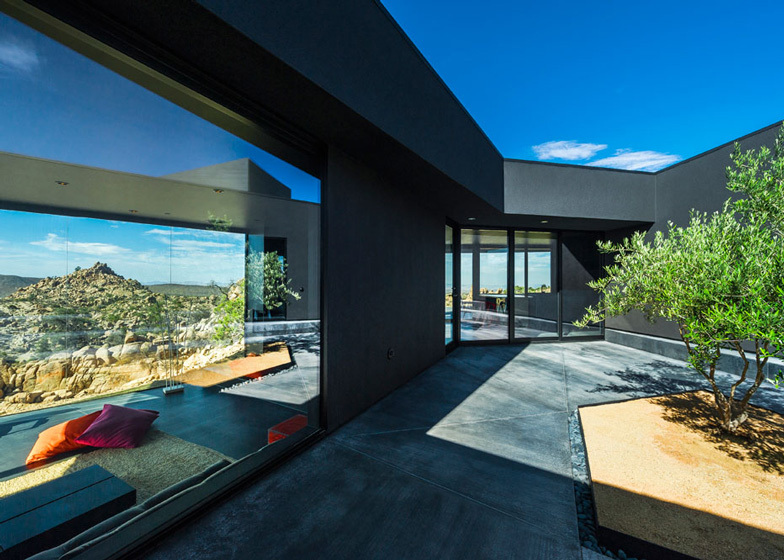 At night the house completely dematerialises and the muted lighting and stars outside blend to form an infinite backdrop for contemplation," said the architects. 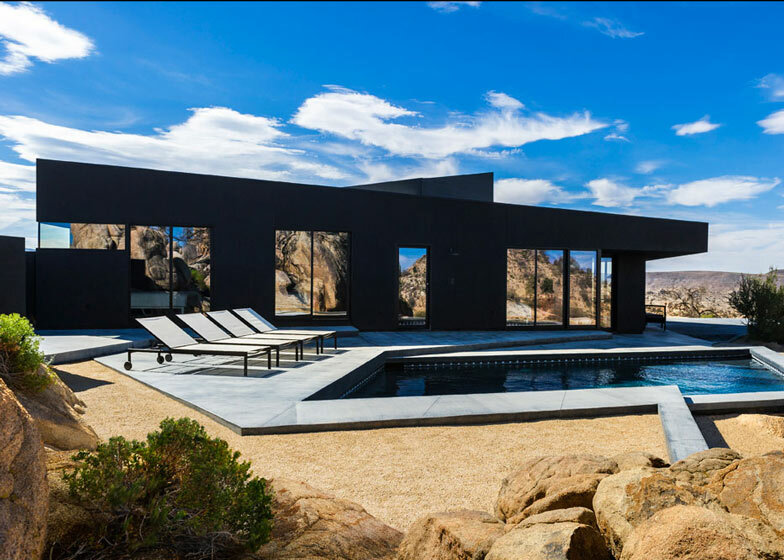 Oller & Pejic Architecture is a husband and wife architecture partnership located in Los Angeles, California. 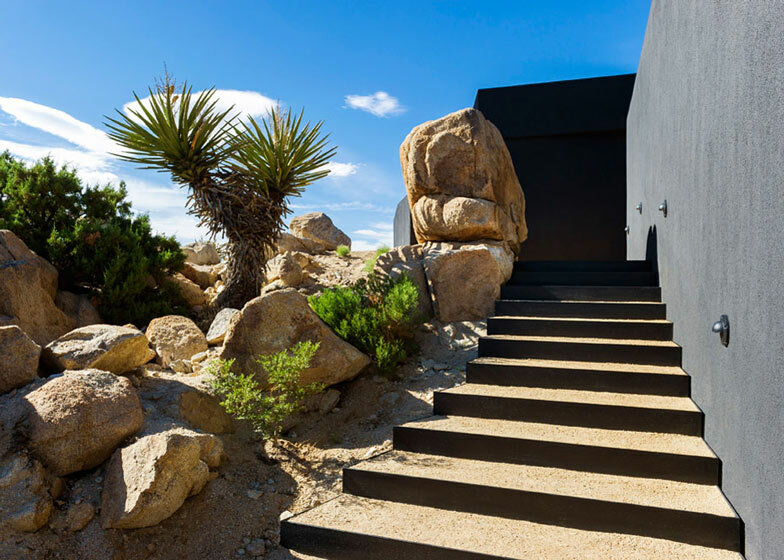 This project began with an e-mail and a meeting in fall of 2008 for a house in Yucca Valley, which is located near Palm Springs, east of Los Angeles in the high desert near the Joshua Tree National Park. 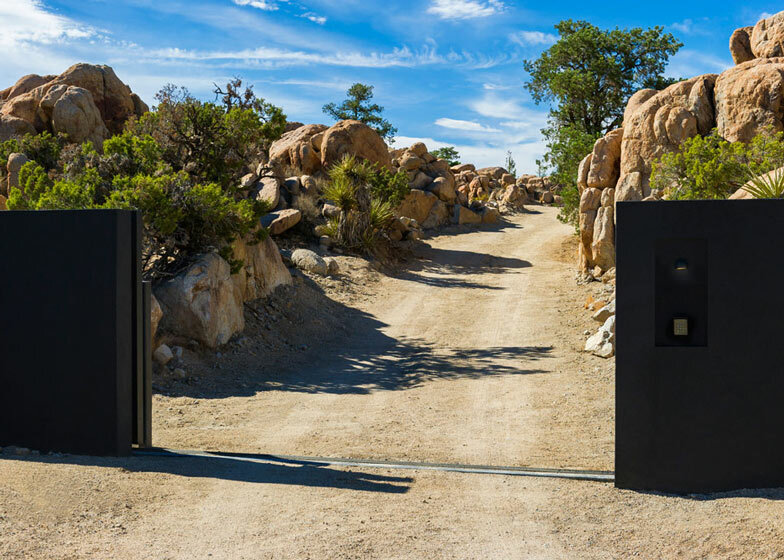 We had completed two projects in Yucca Valley and occasionally received inquiries about projects in the desert. In the midst of the economic downturn typically these inquiring led nowhere. We had just had our second child and things were looking rather uncertain. We decided to meet with Marc and Michele Atlan to see if their project was a reality. Even from the first communications, Marc's enthusiasm was noticeable. Beyond the technical and regulatory challenges of building on the site - several previous owners had tried and given up - there was the challenge of how to build appropriately on such a sublime and pristine site. It is akin to building a house in a natural cathedral. Our client had given us a brief but compelling instruction at the start of the process - to build a house like a shadow. This had a very specific relevance to the desert area where the sunlight is often so bright that the eye's only resting place is the shadows. Unfortunately, the site had been graded in the 1960s when the area was first subdivided for development. A small flat pad had been created by flattening several rock outcroppings and filing in a saddle between the outcroppings. To try to reverse this scar would have been cost prohibitive and ultimately impossible. It would be a further challenge to try to address this in the design of the new house. 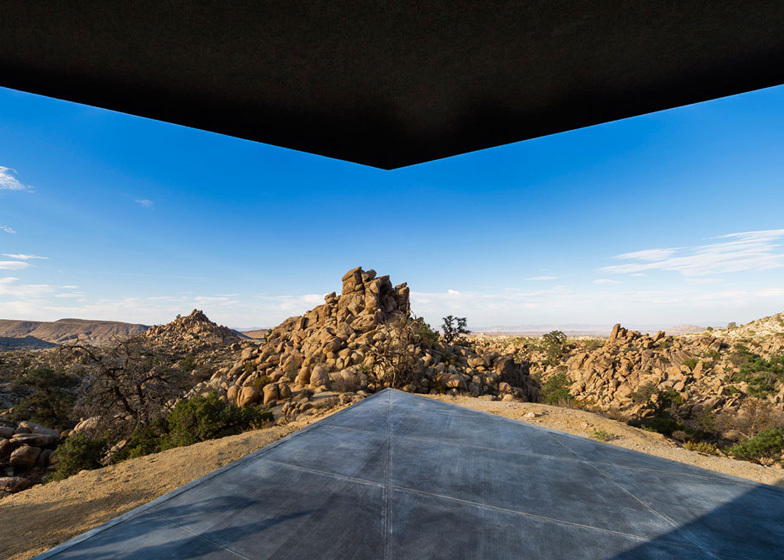 The house would be located on a precipice with almost 360 degree views to the horizon and a large boulder blocking views back to the road. 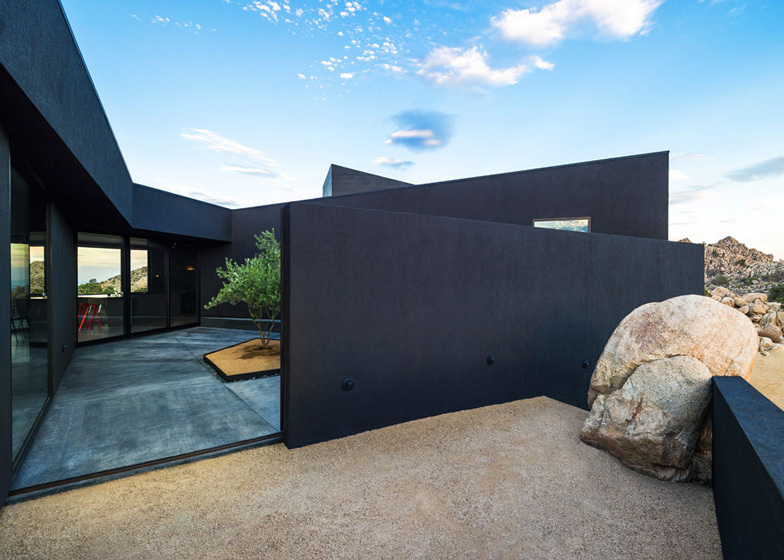 A long process of research began with the clients showing us images of houses they found intriguing - mostly contemporary houses that showed a more aggressive formal and spatial language than the mid-century modern homes that have become the de-facto style of the desert southwest. The living room was summed up succinctly by Marc as a chic sleeping bag. The space, recessed into the hillside with a solid earthen wall to lean your back against as you survey the horizon is a literal campsite which finds its precedent in the native cliff dwellings of the south west. The dark colour of the house interior adds to the primordial cave-like feeling. 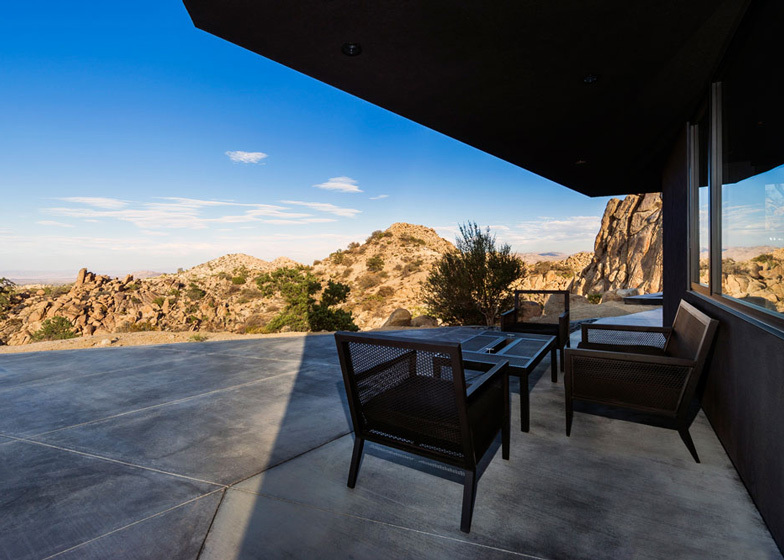 During the day, the interior of the house recedes and the views are more pronounced. At night the house completely dematerialises and the muted lighting and stars outside blend to form an infinite backdrop for contemplation.